Are you interested in getting a critic review of your local business which appears in relation with other such businesses within Google search? Recently Google announced that a publisher can now on apply for participation. In 2015, the Critic Review feature was launched for TV shows, movies and books but it was only last week that Google announced that this feature is now also available for local businesses like local restaurants. Critic Review – How does this feature look? 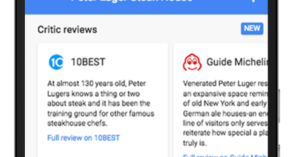 When you type the name of a business, for instance a San Francisco restaurant, you will find the “Critic Reviews” section within the panel of Knowledge Graph for the restaurant when you search it on your desktop. When you search on mobile devices which are more common these days with the soaring number of people who search on mobiles, this Critic Review section gets even more prominent. Who can be listed in Critic Reviews? Till now, content from only the above listed partners would be scheduled to be displayed in the section of Critic Review. It was also heard that one top reason behind review sites like TripAdvisor or Yelp not being includes is because this feature was introduced to highlight critics from the publishers instead of customers at large. While TripAdvisor and Yelp have exceptional content about local businesses, they actually don’t have their own critic reviewers that write reviews from the perspective of publication. This probably disqualified them from being included in the new section for the local business firms. Nevertheless, there’s good news for TripAdvisor and Yelp and that is if they can rectify what they lack, they too, like any other publisher can be included within this feature. No company was invited by Google to participate in this from the beginning but it is just their job to display such information to the users.